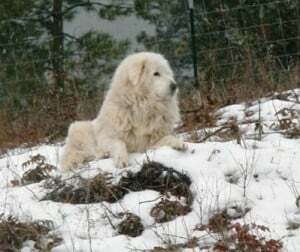 How to be livestock guardian dog in case any of you do-it-yourself are interested! Even though I am a very busy dog, after a bit of negotiation with myself I agreed to do it and so…here is my DIY how-to! Now where should I start. First off, you all need to know that I have a job. Literally. I get paid in many different ways, like kibble and belly rubs, but my job on the homestead is a very important one. I share it with my sister Callie, and together, we are literally in charge making sure that no unwanted animal, person, or thing steps on our homestead without permission. And we take this responsibility very seriously. I was told that we feel that way because it was bred into us by lots of generations before me. My grandfather actually lived and worked in Italy guarding sheep in the hills there. That is where our Maremma Family is originally from and that’s what they did. Do You Need a Livestock Guardian Animal? I don’t know where Italy is, but I do know it is a long way away. My father was brought over to a place called New York where he works now. I am one of his kids!! His name is Crisco, and he taught me how earlier Maremmas took their jobs in Italy very seriously and that their instincts have been passed on (whatever that means) to Callie and me. And now we apply those instincts to our job here! So, what is a livestock guardian dog, you ask? 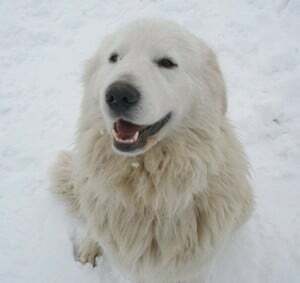 There are some other kinds of livestock guardian dogs besides Maremmas. Lots of people know about the Great Pyrenees. And there are the Kuvasz and the Akbash. We are all big white dogs. The Komondors are white too but wow do they ever have long curly hair! The Anatolian Shepherds have short hair that is usually tan or brown. Then there are the Tibetan Mastiffs and a few other livestock guardian breeds that are less common in the western world. We all came from different countries. But the thing we all have in common is that we have been bred for centuries to defend and protect our charges against predators, even ones that are bigger than us. We are not afraid to give our lives for our livestock or our people. Well anyway, back to Callie and me. This is us on the right–she’s the very cute one and I’m the terribly handsome one. The place we guard and call home now is about four acres. This placed is fenced and it is our place. Our territory. Mom and Dad live here and there are lots of chickens. Sometimes lots of kids. Sometimes other animals. We live on a hill and if we see someone drive up we GO on ALERT. That means that we start our ALERT BARK! Actually we do our ALERT BARK anytime something is out of the ordinary. Like if we hear a coyote, or another dog, or anything outside. We have a few different barks, and even at night Dad and Mom can tell if we are just talking to each other, telling the deer to stay outside the fence, or warning the coyotes to keep right on moving past our place. Our ALERT BARK is pretty impressive if I don’t say so myself. But even our plain Bark is. We even bark at the neighbor cows sometimes but we are learning that they are OK.
Yeah right, anything that big can’t be totally OK, can it? Many people that meet us comment that they are glad they didn’t meet us at night! Well, barking is really our first line of defense. We are not attack dogs, but if necessary we would attack and fight a predator that was trying to hurt our chickens or our people. Actually Callie and I practice wrestling (of course in fun) almost every day. We just want anyone or anything that shouldn’t be around to go away. The Bark is a great tool for that. Pretty proud of it…The BARK…has a real ring to it doesn’t it? So it makes sense that I don’t live in the city, eh? Callie has a great bark too. That is Callie in the picture demonstrating The Bark–I wanted you to know it’s her because I DO NOT WEAR A PINK COLLAR! So anyway, plain and simple…when intruder animals come…we bark…and when they go away we stop. When Mom or Dad want people to come into our fenced property we all follow a procedure. Of course, new people and new cars, including delivery drivers, always get barked at. We won’t let them in until Mom and Dad say they can come in. Mom and Dad say “ENOUGH” to tell us that they are taking charge. We know we need to stop doing what we are doing including barking, and then, well…we stop. Then they tell us the people are OKAY and they are FRIENDS. Then they tell us to “GET BACK AND STAY” so other people can come in when Mom and Dad open the gate. These people have to take off their hats and sunglasses so Callie and I can have a good look in their eyes to see if WE think they are OK.
Did you know we can read? Well we can’t read books but we read eyes and body language. Anyway Mom and Dad tell us again that these people are OK, and then they are our friends too!!! People who don’t know what an LGD is (that is industry talk for Livestock Guardian Dog) are amazed how we can make an instant transition from a barker to a friend. Callie and I are very smart and when those people come again, we will remember that they are OK.
My dog dad told me a funny story when I was a pup. 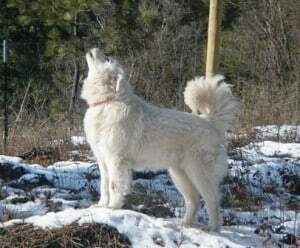 Once at a farm someone came to buy a goat, but the Maremma that lived there wouldn’t stop barking at him. The man was shifty…and the dog wouldn’t stop barking. The mom and dad there finally told the man that he couldn’t buy a goat there because their dog didn’t like him. The man got real mad and his “true” personality came to the surface. Couldn’t hide that from a Maremma! No sireee. We Maremmas are a good judge of character and that is well documented. We actually walk the entire perimeter of the fence line to make sure there are no intruders. Sometimes we go together, and sometimes we take turns. Since we use the same path every day, it gets pretty well worn, but that makes it easier for us to patrol in the dark. Sometimes as evening comes, we just feel the urge to do The Patrol and without warning we just do it. So day and night, we make sure all the animals outside the fence know that this is our place…and they aren’t welcome. We walk all around the fence line. We check on all the chickens and make sure they are doing all right. If they are acting nervous about anything one or both of us will stay with them till they feel better. We check the gates and make sure nothing is trying to get inside. We walk around the barn and the other outbuildings that are in our territory. Sometimes we bark at little chipmunks that are in the woodpile, but we really know they won’t hurt anything. When The Patrol is finished we sit at our vantage point and watch, looking all around until it’s time to make the rounds again. Sometimes we lie down, but even when it looks like we are sleeping, we are on watch. This is me, the regal lion-looking one, wearing a BLUE collar under my beautiful white mane. Even while we’re resting, if anything alarms us, we are up and running in seconds. Our dad and mom have seen us talk to each other and then go to separate corners of the property if there are two alarming things at the same time. Well, let’s see what else…oh yes, we are big. Like over 100 pounds big. So if the Bark doesn’t scare a predator away, we can run toward it and that is also scary. If need be, we could slam ourselves into the intruder which would be pretty dramatic. We could also fight, but our real goal is not to fight, but just get the predator or intruder to hightail it away and never come back. Oh—and don’t ask us to herd animals. We don’t do that–we have to draw the line somewhere! Protection– that’s what we do. We are not herding dogs any more than herding dogs are livestock guardians. The only time we herd is if we need to keep our animals in a corner safe from a predator. Everybody knows Callie and I are security guards and not pets, but sometimes I humor the little kids when they want to scratch my belly and pet me. Sometimes it looks like I am asleep but I am always on guard. In fact, when kids are here, one of us stays close by them at all times. Livestock guardians like us are happy to protect chickens as well as miniature cattle breeds and more. I guess that’s about it for my story today–Callie is calling me for Patrol duty. One quick look back at my post first though…and you know what? I don’t think any of you could be livestock guardian dogs. Because if you are reading this post, you are probably not a dog. 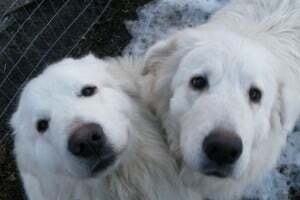 If you know any livestock guardian dogs, could you read this post to them? Just in case they need a refresher course, you know.